that makes finding and reading content written in other languages easier. Translated search is great because it helps you find information from sites written in other languages. We've offered this feature in Google Translate for a while, but now we're integrating it fully into Google search, making it easier for you to find and read results from pages across the web, even if they weren't written in a language you speak. Now, when you search on Google for something in your own language, you can use this tool to search the web in another language. Click "Show Options" at the top of the search results page and select "Translated search" to try it out. We'll algorithmically select the best language(s) to translate your search query into and then return you translated results from those pages. We'll even display results from multiple languages. 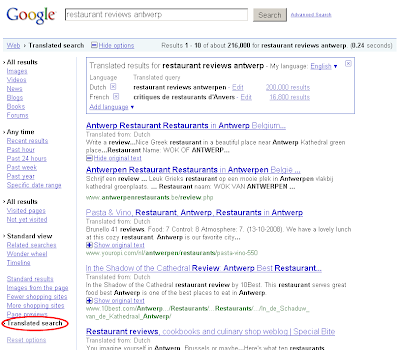 For example, if you search for [restaurant reviews antwerp] while on vacation in Belgium and want to find more reviews or review sites beyond those that are just available in English, select "Translate search" in the "Show Options" panel. We'll automatically select French and Dutch (the languages spoken in Belgium), translate your query into these languages and then translate the results back into English for you to read. If you’d like to search specific languages, just modify the languages in the panel above the results. You can display results for up to five languages at once and select from 51 languages to search. Of course, the algorithm that determines which languages to translate your search query into isn't perfect, but we’re working to improve it. We're rolling this out over the next day — keep an eye out. So if you’re traveling and want to find hotels, restaurants, activities or reviews written from a local perspective, or if you're just curious to find what’s being written about a company, product or topic in another language, give Translated search in the Search Options panel a try. Searching the global web has never been easier! Today, we’re excited to introduce a new "Translated search" tool in the Search Options panel that makes finding and reading content written in other languages easier. Translated search is great because it helps you find information from sites written in other languages. We've offered this feature in Google Translate for a while, but now we're integrating it fully into Google search, making it easier for you to find and read results from pages across the web, even if they weren't written in a language you speak.